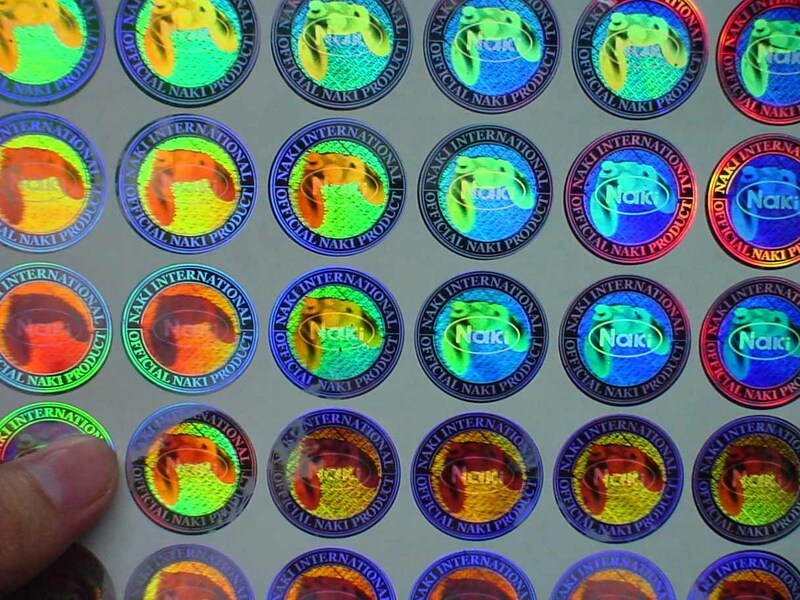 Holographic anti-counterfeit labels produced by professional security companies the first designers design laser holographic effect diagram. The hologram master system by professional laser plate-making factory, the security company under this master tomolded corresponding laser holographic film, and then through a holographic anti-counterfeit labels can be used with glue, double bottom, die-cutting process. In the production process can increase digital anti-counterfeiting technology, fluorescent anti-counterfeiting technology, ultra-miniature anti-counterfeiting technology, laser burning white, ultra-lines, so as to further improve its anti-counterfeiting efforts. First, it beacuse that hologram Inimitable own structure . Now most of the molded anti-counterfeit label, hologram hot stamping or holographic printing records one or more two-dimensional plane rainbow hologram pattern . Using hologram reproducing the characteristics of the three - dimensional stereoscopic images. It can be two or more) planar pattern coding along vertical stratification recorded on the hologram that re-emerged at different depths, each other plane image of the occlusion . Since the rainbow hologram has a variable nature of the color of the reproduced image , false color coding techniques can be used , so that different patterns or different portions in the same pattern reproduced in different holographic colors . Hologram itself is a high - density complex grating, so even if the same person in different places with the same pattern and no legal system a grating identical two hologram , different people harder to copy . This difference is most obvious manifestation for reproducing image layered depth and distribution of the different colors , of course , also includes the different indicators of the diffraction efficiency , the viewing angle , and SNR . So even with a full set of equipment and technology , generic the embossed hologram anti-counterfeit labels other home , is not an easy thing . That's why hologram itself is difficult for copying. Third, encrypted information in hologram sticker also make hologram is difficult to copy. The use of special optical coding technique can be encrypted in the hologram label, hologram hot stamping. These holograms or may be the reproduced size of the object with the human eyes to the change in distance between the hologram changes, or stored in the hologram of a point addition information, or the hologram itself is generated by a computer dot-matrix system. With a special three-dimensional object model as the target of the hologram, the reproduction is a perspective view identical to the original. Because of the higher technological content, therefore more difficult to be copied. Because recorded on the hologram backsheet is a thin, dense interference fringes, so the photosensitive material requires high-resolution. Ordinary photographic uses photosensitive film due to coarse particles of silver compounds can only record 50 to 100 per millimeter of stripes, the photosensitive film Tianjin plant the production of I-type hologram dry plate, with a resolution of up to 3000 per mm, can meet hologram photographic requirements. The washing process is also critical. We follow the recipe requires dispensing with the developer, stop bath and fixer and bleach solution. The above several prescriptions are required to use distilled water, but the experiment proved successful with pure water preparation. The flushing process in the darkroom, the drug solution should never see the light and kept at room temperature about 20 ℃ rinse the preparation time drug solution custody properly, can be use in a month or so.